Addiction is an installation by Timo Heino, which was first displayed in Galerie Anhava-2011 and later in Helsinki Art Museum as a part of his retrospective exhibition in 2013. The installation consists of blank aluminum cans with water inside and a pair of twisted shopping carts. Addiction Re Cycle is an intervention by Tatu Engeström. 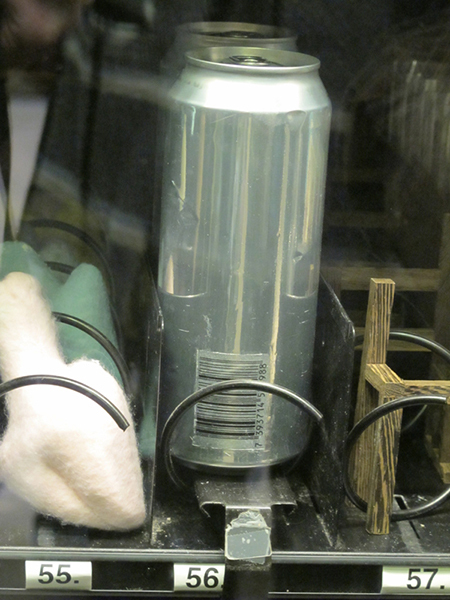 Engeström transferred a black barcode from a consumer beverage can onto a blank aluminum can originating from Heino’s installation. Through this gesture the blank can becomes refundable when recycled. Addiction Re Cycle is displayed as an object and is a collaborative work by Engeström and Heino.